Dora Holzhandler - Girl in the sea - Online gallery supplying original fine art. Trending Modern British and Contemporary Welsh. Available for sale from Big Sky Fine Art; this original pastel and pen artwork on paper by Dora Holzhandler; dated 2007.<br> The work is presented and supplied in a sympathetic contemporary frame, mounted using conservation materials and behind non-reflective glass. <br> <br> Dora Holzhandler was an exceptional artist of Polish-Jewish descent who escaped Nazi persecution in Europe to forge a successful career in Britain.<br> <br> She was discovered by artist Victor Pasmore in 1947 and had her first exhibition in 1954. She continued to exhibit for more than sixty years.<br> Today her paintings are on display in the Museum of Modern Art in Glasgow and the Jewish Museum London as well as many museums and collections both in the UK and abroad.<br> <br> Dora Holzhandler was born to Jewish-Polish parents, who had fled anti-semitic persecution in their native Warsaw and met and married in London. They were living in Paris when Dora was born in 22nd March 1928. Her father had fought for the British Army in WW1 and gained British nationality. He was a handbag maker and her mother was a seamstress. Their livelihood suffered as the world economy moved into recession following the Great Crash and Dora was fostered for five years by a French farming family in Normandy. She returned to Paris in 1933 and became close to her maternal grandfather, a devout rabbi, who was later killed in Auschwitz. In 1934, she moved to London where the family lived as part of the vibrant Jewish community in the East End, and was evacuated to Norfolk, aged eleven, at the outbreak of WW2. <br> <br> In 1948 Holzhandler returned to Paris where she studied French literature at the Sorbonne and attended the Académie de la Grande Chaumière, founded in 1902 by Swiss artist, Martha Stettler, as an anti-academic school. Then she returned to England and in 1948 enrolled at the Anglo-French Art Centre, London, where visiting artists included Henry Moore, Graham Sutherland, Francis Bacon, Vcitor Pasmore and Jacob Epstien. She also met there her future husband, George Swinford and they settled in Hampstead.<br> <br> For the next sixty years Holzhandler managed to combine a busy family life – they had three daughters – with painting and exhibiting. She produced a wealth of oils, watercolours and pastels.<br> <br> It is often said that she painted in the naive style, influenced by Marc Chagall and Henri Matisse. Nevertheless, it does not quite seem right to describe her output as “naive”. Holzhandler had a diverse cultural heritage, was well –travelled and well-educated. <br> Stylistically, she drew on folk art and children’s illustrations. Her work often incorporates repeated iconography, mystical and religious symbolism influenced by her personal beliefs She did not draw or paint directly from life or make preliminary studies, but rather found her subjects in her rich visual imagination. She described her artistic process as “a divine world of paly” through which a pristine, though familiar world is created. Her subjects are lovers, children and families, often based on childhood memory, but with a kind of timeless presence. What she draws out and represents is the joyousness at the heart of all lives which are enriched by love – of partner, family, community and creation.<br> <br> Holzhandler discovered Buddhism in the early 1950’s, but was also a student of the Jewish Kabbalah. Thus, a self-declared “Jew-Bu”, she drew inspiration from both the mundane and the mystical aspects of Jewish life and her conversion to Buddhism, which strongly influenced her painting both in subject matter, symbolism and artistic traditions. Her works serve to confirm her open and celebratory view of existence, even where events bring tragedy and sadness. <br> <br> In 2007, the National Theatre in Warsaw illustrated its programme of a play by Isaac Bashevis Singer with her paintings.<br> <br> Holzhandler was a favourite of art loving celebrities. Admirers included the late Charlie Chaplin (whose portrait she painted); the art historian Sister Wendy Beckett, who described her as an artist for whom "all is sacred'; as well as actress Maureen Lipman and the comedian Jack Dee, both of whom opened shows for her during her career. She also befriended violinist Nigel Kennedy in 2012 after inviting him to a gallery viewing, later painting his portrait. She was subsequently commissioned by him to paint the artwork for his 2013 album “Recital”.<br> <br> She died on 8th October 2015 at the age of 87. A spokesperson for the family said: “She was a feisty woman who was ahead of her time. Eschewing traditional paths, she forged a highly successful career among a midcentury male-dominated art world, sticking resolutely to her distinctive painting style. Above all, her devotion to her role as wife, mother and grandmother shone continuously through her subject matter, which she depicted with touching, simple elegance and subtle humour.”<br> <br> This delightful original work in watercolour and felt pen depicts a naked young woman standing in the sea, the water lapping up to her thighs. She is wearing nothing but a pensive, almost quizzical expression and has her head tiled to her left side. She has blue eyes and her long black hair tumbles over her shoulders and down her back. Her hands are slightly raised by her sides and she epitomizes freedom and contentment. Each side of her there are large rounded plants, of an indeterminate variety, or perhaps they are boulders from the sea. The sea is a soft green, the sky shades of blue and purple. The image is gentle, naive, and rather lovely. Available for sale from Big Sky Fine Art; this original pastel and pen artwork on paper by Dora Holzhandler; dated 2007. Dora Holzhandler was an exceptional artist of Polish-Jewish descent who escaped Nazi persecution in Europe to forge a successful career in Britain. She was discovered by artist Victor Pasmore in 1947 and had her first exhibition in 1954. She continued to exhibit for more than sixty years. Today her paintings are on display in the Museum of Modern Art in Glasgow and the Jewish Museum London as well as many museums and collections both in the UK and abroad. Dora Holzhandler was born to Jewish-Polish parents, who had fled anti-semitic persecution in their native Warsaw and met and married in London. They were living in Paris when Dora was born in 22nd March 1928. Her father had fought for the British Army in WW1 and gained British nationality. He was a handbag maker and her mother was a seamstress. Their livelihood suffered as the world economy moved into recession following the Great Crash and Dora was fostered for five years by a French farming family in Normandy. She returned to Paris in 1933 and became close to her maternal grandfather, a devout rabbi, who was later killed in Auschwitz. In 1934, she moved to London where the family lived as part of the vibrant Jewish community in the East End, and was evacuated to Norfolk, aged eleven, at the outbreak of WW2. In 1948 Holzhandler returned to Paris where she studied French literature at the Sorbonne and attended the Académie de la Grande Chaumière, founded in 1902 by Swiss artist, Martha Stettler, as an anti-academic school. Then she returned to England and in 1948 enrolled at the Anglo-French Art Centre, London, where visiting artists included Henry Moore, Graham Sutherland, Francis Bacon, Vcitor Pasmore and Jacob Epstien. She also met there her future husband, George Swinford and they settled in Hampstead. For the next sixty years Holzhandler managed to combine a busy family life – they had three daughters – with painting and exhibiting. She produced a wealth of oils, watercolours and pastels. It is often said that she painted in the naive style, influenced by Marc Chagall and Henri Matisse. Nevertheless, it does not quite seem right to describe her output as “naive”. Holzhandler had a diverse cultural heritage, was well –travelled and well-educated. Stylistically, she drew on folk art and children’s illustrations. Her work often incorporates repeated iconography, mystical and religious symbolism influenced by her personal beliefs She did not draw or paint directly from life or make preliminary studies, but rather found her subjects in her rich visual imagination. She described her artistic process as “a divine world of paly” through which a pristine, though familiar world is created. Her subjects are lovers, children and families, often based on childhood memory, but with a kind of timeless presence. What she draws out and represents is the joyousness at the heart of all lives which are enriched by love – of partner, family, community and creation. Holzhandler discovered Buddhism in the early 1950’s, but was also a student of the Jewish Kabbalah. Thus, a self-declared “Jew-Bu”, she drew inspiration from both the mundane and the mystical aspects of Jewish life and her conversion to Buddhism, which strongly influenced her painting both in subject matter, symbolism and artistic traditions. Her works serve to confirm her open and celebratory view of existence, even where events bring tragedy and sadness. In 2007, the National Theatre in Warsaw illustrated its programme of a play by Isaac Bashevis Singer with her paintings. Holzhandler was a favourite of art loving celebrities. Admirers included the late Charlie Chaplin (whose portrait she painted); the art historian Sister Wendy Beckett, who described her as an artist for whom "all is sacred'; as well as actress Maureen Lipman and the comedian Jack Dee, both of whom opened shows for her during her career. She also befriended violinist Nigel Kennedy in 2012 after inviting him to a gallery viewing, later painting his portrait. She was subsequently commissioned by him to paint the artwork for his 2013 album “Recital”. 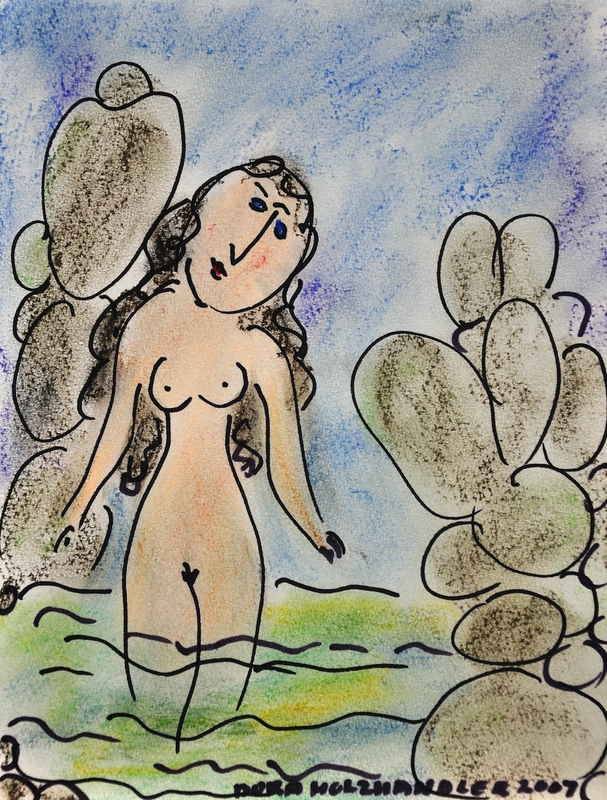 This delightful original work in watercolour and felt pen depicts a naked young woman standing in the sea, the water lapping up to her thighs. She is wearing nothing but a pensive, almost quizzical expression and has her head tiled to her left side. She has blue eyes and her long black hair tumbles over her shoulders and down her back. Her hands are slightly raised by her sides and she epitomizes freedom and contentment. Each side of her there are large rounded plants, of an indeterminate variety, or perhaps they are boulders from the sea. The sea is a soft green, the sky shades of blue and purple. The image is gentle, naive, and rather lovely.